What is a Mississippi Eviction Notice? Mississippi Eviction Notice: What Is It? A Mississippi eviction notice is also known as a notice to quit. 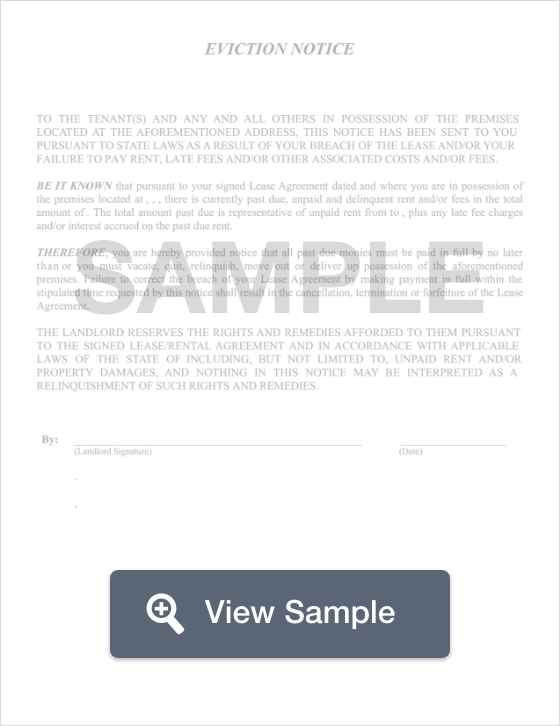 It is a written document issued by a landlord to a tenant when the tenant doesn’t abide by the terms of the lease. It tells the tenant how they violated the lease, what they need to do to remain on the property, or when they need to return the property back to the possession of the landlord. All Mississippi eviction notices must comply with the state’s landlord-tenant laws. What Are the Components of a Mississippi Eviction Notice? A completed Certificate of Service that gives the date the notice was served, on whom it was served, and how it was served. It should also be signed by the person who completed service. A Mississippi eviction notice must be legally served. Legal service methods include personal service on the tenant or on a person who lives on the property who is at least 13 years old. It can also be sent via certified mail with return receipt requested. The return receipt is important because the landlord will need to file a copy of it with the court if they file a lawsuit against the tenant. Now that you know about the components that should be found in every Mississippi eviction notice, let’s look closer at the most commonly used versions. A 3-day notice to pay or quit for non-payment of rent advises the tenant that they did not pay their rent on time. The tenant is given three days from the date they are served to pay the rent or vacate the property. This notice should include the full amount of rent that is past due, the date by which it must be paid, acceptable payment methods, and to whom the past due amount may be paid. Mississippi § 89-7-27 governs this particular notice. A notice to quit for non-compliance is generally for 30 days for first offenses and 14 days for second violations that take place within six months of the first violation (§ 89-8-13). When a 14-day notice is issued, the tenant is not being given the opportunity to correct the lease violation. They are being given 14 days to vacate the property. This notice to quit should explain the violation of the lease, whether the tenant has the ability to correct the lease, by when the violation must be corrected or vacate the property, and whether this is a first offense. If it is a second offense, it would be prudent for the landlord to list the date that the first breach took place and when the first notice to quit was issued. A 30-day notice to quit isn’t exactly an eviction notice. It can be written by either the landlord or the tenant. It informs the other party that the month-to-month tenancy agreement will end in 30 days. This letter must conform with § 89-8-19. It should list the date by which the property must be or will be vacated. What Are the Legal Considerations of a Mississippi Eviction Notice? A Mississippi eviction notice is the very first action a landlord may take if they want the tenant to leave the property while the lease is still active. This notice must be served before the landlord can file an eviction lawsuit against the tenant. Unless a landlord gets a court order, they may not remove the tenant’s belongings, change the locks, or turn off the utilities. Performing any of those actions before the court gives the landlord an order is known as self-help eviction, and is illegal. It is also illegal for the landlord to evict the tenant if they report the property to the housing authority for code violations. Landlords also may not evict tenants because of their actual or perceived race, skin color, religious beliefs, national origin, gender, disability, or family status (including the presence of minor children or a pregnant tenant). Eviction can be a scary experience. As a tenant, you have rights even during the eviction process. As discussed in the section above, you may not be evicted for discriminatory reasons, because you reported the property or the landlord to housing authorities, or through self-help means (without a court order). If you receive an eviction notice, read it carefully. First you must determine whether it is a first notice or a second notice. If it is a second notice within six months of the first notice, you may not have any option but to vacate the property by the date stated in the notice. So, again, read it carefully. Understand the reasons why you can and can’t be evicted. If you think that the eviction against you is illegal, you have some options. Your first option is to talk with a landlord-tenant lawyer. If you have a valid illegal eviction claim, you may be entitled to file a lawsuit against the landlord for financial compensation. Your second option is to contact University of Mississippi School of Law or Mississippi College School of Law. They may have a legal clinic that provides low-cost or free legal help with evictions. Your third option is to contact a legal aid office near you. If you meet their qualifications, you may be entitled to free or low-cost legal help. If you don’t meet their qualifications, they may be able to point you in the right direction or help you access some valuable self-help resources. All Mississippi eviction notices must comply with the state’s landlord-tenant laws. They must be legally served. As explained above, that means serving the tenant in person or serving someone who lives on the property who is at least 13 years old. You may also serve the tenant via certified mail provided that you have a return receipt requested so that you may put the return receipt on file with the court if you decide to file a lawsuit. Landlords may not remove the property of the tenant, turn off the utilities to the property, or change the locks unless they first get a court order. Doing so without the order could open the landlord up to a lawsuit. Landlords also may not evict a tenant in retaliation of the tenant reporting the property for code violations. The landlord also may not evict the tenant for discriminatory reasons. If you’re a landlord and you have questions about Mississippi eviction notices or your duties and rights, contact a qualified landlord-tenant attorney.